Dr. Niswander is co-owner of Niswander Environmental, Paw Paw Wetland Mitigation Bank, and the Clinton River Wetland Mitigation Bank. 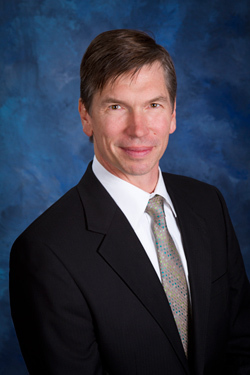 Dr. Niswander has over 18 years of wetlands and environmental management experience. Dr. Niswander is one of the founding members of the Michigan Wetlands Association (MWA) and was elected its first President. His areas of research included wetlands for wastewater treatment, water quality, and ecological modeling as well as mitigation wetland functions. At the Iowa DOT, Dr. Niswander completed delineations and 404 permits, located and designed wetland mitigation sites, provided construction oversight, and developed the Iowa DOT Mitigation Monitoring Protocol. As a consultant, Dr. Niswander provides comprehensive ecological services to developers, transportation agencies, municipalities, and non-profit agencies and has managed all aspects of hundreds of wetland, stream, and floodplain projects. He has extensive experience with site planning and design and large-scale project management. Dr. Niswander is recognized as an expert in wetland science, GIS-based Natural Features Inventories, stream restoration, and innovative stormwater treatment. Dr. Niswander’s work also includes bio-monitoring, design-build wetland mitigation, ecological inventories, geomorphological stream assessments, threatened and endangered species surveys, in-depth GIS services, green building, and expert testimony. Client manager for comprehensive environmental services provided to the Township since 2006. Administer the City’s wetland, floodplain, environmental features setback, and stormwater ordinances. Guide planning issues regarding infrastructure projects, and perform site plan reviews of commercial, industrial, and residential site developments. Offer innovative solutions to lake restoration and stormwater management issues as part of the site plan review process in this lake community. Provide expert testimony. Serve as general contractor for $1.5 million dollars of habitat restoration at the Gateway to the Detroit River International Wildlife Refuge in Wayne County, MI. Project Manager responsible for restoration of 1,200 linear feet of degraded shoreline along the Detroit River, capping 15 acres of brownfield land with 50,000 cyd of fill, creation of 3 acres of coastal wetland, restoration of 20 acres of upland prairie habitat, seeding and planting, and invasive species control. Conducted baseline hydrogeomorphic stream evaluation of a 1-mile stretch of Malletts Creek that resulted in natural channel design to increase hydraulic capacity for the degraded watercourse. Responsible for design of in-stream structures and the development of an off-line detention basin created to reduce stormwater volumes/velocities. Assisted with landscape plans, wetland delineations, and wetland permitting. Responsible for oversight during construction of in-stream structures and detention areas. Project Manager for design of $750,000 GLRI-funded habitat restoration project within the Ottawa County Parks, located in the City of Holland, Ottawa Co., MI. Responsible for wetland and stream restoration design, drafting of contract documents, and construction oversight. Serve as Project Manager and General Contractor for the restoration of a City-owned parcel in New Baltimore, Macomb Co., MI. Responsible for implementing the restoration plan that involved controlling non-native vegetation, the filling of several on-site degraded ditches, and the removal of fill from previously impacted wetland areas to create a trail network through the 35-acre park. General contractor responsible for design/build of a 20-acre mitigation wetland located in Ottawa County, MI. Serve as Project Manager responsible for wetland delineation and permitting, negotiations with state and local agencies, mitigation site selection and design, oversight during construction of the wetland basin, seeding and planting, and invasive species control. Assisted with corrective actions to repair eroded streambanks and other SESC issues. Provided Corrective Action recommendations and implementation including invasive species control and tree planting for fifteen (15) existing MOT mitigation sDites throughout Michigan. Completed wetland assessment and design services to MDOT for six wetland mitigation projects to offset transportation project impacts: M59/Howell Airport (2005), Maple River Watershed (2006), Black River Watershed (2006), Michigamme Watershed (2007), Cass River Watershed (2009), Grand Watershed (2012). Design work included site assessment, permitting, justification report, water budget, special provisions and cost estimates. Two of these projects also included a watershed-wide GIS-based mitigation property search. Project Manager responsible for design to retrofit the degraded Taft and Bishop Regional Detention Basins to improve storage, water quality, and wildlife habitat. Conducted hydrogeomorphic stream assessment and natural channel design which resulted in a self-sustaining stream that not only improves flood storage but also allows for fish passage and creates valuable aquatic habitat. The outlet structures were modified to reduce the peak flows and allow for the flood water to come out of the stream banks and fill the newly created floodplain wetlands. Provided construction oversight of in-stream structure installation and planting/seeding. Currently completing 8 years of MDEQ required monitoring for the basins and stream restoration. Currently own and operate two Wetland Mitigation Banks, which are two of four MDEQ approved private banks in Michigan. Completed all aspects of Bank establishment including site search, acquisition, wetland design, MDEQ banking agreement process, permitting, construction, planting/seeding, and maintenance/monitoring. Provided hydrogeomorphic stream assessment, natural channel design to increase hydraulic capacity, design of in-stream structures, development of treatment wetlands to reduce stormwater volumes/velocities as well as pollutant loading. Utilized ARRA funding and MDEQ SRF. Oversaw construction of in-stream structures and planting and seeding of natural areas. Project and Client Manager of design/build contract to construct 9 acres of wetland mitigation using surface water impoundment to fulfill mitigation needs of a large development company. Coordinated all aspects of project planning and implementation. Installed over 2,800 bare-root trees into the mitigation wetland in 2008 and continue to provide monitoring and management. Project and Client Manager of design/build contract to construct 13 acres of wetland mitigation and 7 acres of prairie on Oakland County Parks property to fulfill mitigation needs of the Road Commission of Oakland County. Responsible for wetland design, construction oversight, site seeding, corrective actions, invasive species management, and oversee wetland mitigation monitoring events and overall site management through 2012. Agency and Project Manager for wetland and planning services on Ypsilanti Township property slated for large-scale commercial development that included complicated wetland, floodplain, and stormwater management issues. Conducted wetland delineation on 170 acres, identified mitigation area, developed alternative site master plans for the property, and obtained MDEQ wetland and floodplain permits. Completed design of mitigation wetland, detention basins, and pre-treatment infiltration trench in 2005. Construction oversight completed in 2006 and annual monitoring of the site is scheduled to be completed in 2012. Project Manager for extensive inventory and mapping project designed to assist the MI Dept. of Natural Resources in developing a long-term strategy to combat invasive species within Sterling State Park (Monroe Co., MI). Conducted a GIS-based inventory of stands of Phragmites using GPS within the State Park, totaling over 750 acres. Following mapping protocol, chemically treated approximately 270 acres of Phragmites using ATVs, John Boats, an Argo amphibious vehicle, and backpack sprayers. Provided MDNR with comprehensive GIS-based final product. Project Manager responsible for development and implementation of planting plan that involved installation of plants into a treatment wetland for the purpose of filtering pollutants prior to discharge. Installed over 7,500 bare-root plugs into four treatment cells and seeded each basin. Project Manager for wetland and stormwater management aspects of large-scale commercial development in Rochester Hills. Site planning included incorporating the stormwater management system into an existing deteriorated peat wetland that will restore the wetland’s hydrology. The site was monitored annually per MDEQ requirements until 2011. Completed habitat assessment of five vacant parcels in Rochester Hills proposed for preservation as part of a Michigan Natural Resources Trust Fund Grant that will serve as a critical link between existing green corridors and will help preserve the high quality of the Stony Creek Watershed. Woodlands, wetlands, streams, and old field habitat were assessed qualitatively and several unique natural features were identified. Assisted with a Floristic Quality Assessments and GIS-based mapping procedures. Smallenburg Park Urban Stormwater Demonstration Project: Transformed low-quality, aesthetically unpleasant urban drainage swales into pleasing rain gardens for public education within a Holland park. Noordeloos Creek BMP Demonstration Site: Designed and constructed wetland designed to intercept floodwaters to reduce sediment and phosphorous loads in the Macatawa Watershed. MDOT & Ottawa Co Rd Comm. Bioswales: BMP sites in cooperation with transportation agency stormwater management. City of Zeeland Bioswale & Rain Garden: Two City-owned sites intended as public demonstrations of native landscaping for water quality. Project Manager providing control of invasive vegetation within two MDNR-owned parks. Used cut stump treatment methods to control woody species threatening critical oak savannah habitat at Petersburg SGA (Monroe County, MI), and used foliar treatments to control invasive Phragmites at a high quality coastal wetland known as Petobego Marsh (Grand Traverse County, MI). Project Manager for delineation on 415-acre site in Northville Township for private development. Conducted pre-application meeting with MDEQ to obtain concurrence. Oversaw assessment of woodlands on site including a quality rating utilizing historical aerial photos to confirm age class. Assisting property owner and Township in obtaining grants to preserve portions of the parcel to create a contiguous green corridor. Project Manager to oversee wetland delineation and permitting services, wetland mitigation site selection and design, and construction activities. Heavily involved with extensive negotiations with MDEQ, MDNR, and State of Michigan Dept. of Technology, Management, and Budget (DTMB) to ensure a successful project. Provided landscaping plans and specs per stringent DTMB requirements. Responsible for design of floodplain mitigation and stream restoration involving construction of a floodplain shelf to provide additional flood storage, in-stream channel restoration in the form of cross-vanes to divert flow away from eroded banks, and streambank stabilization using innovative bio-engineering techniques. Designed and obtained approval for a model open space development plan for a large-scale residential development, which included rain gardens, treatment wetlands, stormwater detention basins, one mile of stream restoration, and 8 acres of prairie establishment. After initial implementation of the open space development plan, reviewed and provided remediation suggestions. Oversaw implementation of recommended corrective actions, which included in-stream structures, modifications to constructed wetlands, and planting and seeding of the entire site. Completed long-term maintenance plan for the homeowner’s association. Completed streambank restoration along eroded banks, and provided three years of monitoring of stream and treatment wetlands to meet MDEQ requirements. Project and Client Manager for biofiltration system design utilizing rain gardens and bioswales to intercept road runoff as part of Grand River Avenue improvements between Pleasant Valley and US-23. Design plans included Biofiltration Special Provision and Construction Quantities, and were incorporated into Engineers Construction Bid Package. Project Manager for completion of NFI encompassing the entire Township. Mapped and field assessed all natural features including wetlands and watercourses, lakes, floodplains, woodlands, prairies, and threatened and endangered species. Developed a comprehensive GIS database that included ranking of Priority Natural Areas that will be utilized to establish local ordinances. Coordinated public hearings for NFI. Project Manager for stream restoration project on the Rouge River intended to protect a shared residential bridge from erosive flows utilizing in-stream structures. At the request of Michigan Department of Environmental Quality (MDEQ), designed and oversaw installation of two cross vanes, one upstream and one downstream of the bridge. Site has become a demonstration site for MDEQ on best management practices. Project Manager for wetland delineation and permitting and mitigation site location and design within road improvement project corridor. Conducted MDEQ negotiations for expedited permit issuance, including final mitigation plan acceptance. Conducted habitat assessment for the state endangered southern redbelly dace and white gentian and the state threatened ledberg’s panic grass along the Huron River for a HDPE stormwater installation. Submitted determination of effects report to the MDEQ. Redesigned stream restoration corridor as part of a residential development in Taylor, including replacement of failing j-hooks, cross vanes, and other bioengineering techniques to meet MDEQ standards. Oversaw installation of new in-stream structures. Project Manager for wetland permitting, mitigation site location, and site planning for a commercial development in Westland. MDEQ wetland permit was denied due to large amount of impact and is currently a contested case. Currently under retainer to provide expert testimony regarding wetlands takings issues. Designed bioswale used as a demonstration of Best Management Practices for stormwater management and water quality improvement. Design included innovative water quality treatment system incorporating infiltration trenches and native plantings that will reduce sediment and nutrient loading into Meadow Lake. Project Manager for completion of NFI encompassing the entire City. Mapped and field assessed all natural features including wetlands and watercourses, woodlands, steep slopes, and floodplains. Developed a comprehensive GIS database that included ranking of Priority Natural Areas. NFI was utilized in the development of the City’s Master Land Use Plan and is currently being incorporated into a new Open Space ordinance. Also assisted in development of Steep Slope ordinance that resulted from the NFI completion. Client manager for comprehensive environmental services provided to the City. Administered City’s wetland and watercourse ordinances, which required review of all new site plans. Guided the city in infrastructure planning including wetland permitting, threatened and endangered species survey, drain relocation, and water and sewer extensions. Completed wetland delineation, wetland permit, mitigation site location, mitigation design, and construction in record time assuring the opening of Hartland High School. Project manager for the completion of an Environmental Assessment for the widening of Novi Road from two lanes to five lanes. Significant historical, wetland, access, noise, and contamination issues were addressed. Managed all aspects of EA including public involvement, alternatives analysis, and coordination with MDOT, MDEQ, and FHWA. Mapped all wetlands in a 2,000-acre watershed. Conducted a functional assessment of 218 acres of wetland. Created a GIS wetlands coverage with a functional assessment attribute for use with the city’s GIS. Inventory used for site planning, wetland protection, and stormwater management. Conducted wetland alternatives analysis for new alignment using GIS, CAD, aerial photographs, and field investigations. Wrote wetland, threatened and endangered species, land use, and 4(f) evaluations portions of the EA. Delineated 23 wetlands totaling over 30 acres. Located mitigation sites and developed mitigation plan for creation of 50 acres of wetland. Wetland and woodlands mapping and inventory on 0.25 mile wide by 6 mile long corridor. Developed preferred alternative and wrote biological assessment for inclusion in EIS. Located 150 acres of woodland mitigation and wetland preservation. Niswander S.F. (Invited Speaker) 2011. Wetland Mitigation Regulatory Requirements: Michigan Wetlands Association Annual Conference, Traverse City, MI. Niswander S.F. (Invited Speaker/Panelist) 2009. Michigan Wetland Protection and Mitigation: Program Overview and Comparison to ACOE Program. Michigan Bar Association Annual Meeting, Southfield, MI. Niswander, S.F., and W.J. Mitsch. 1995. Functional analysis of a two-year-old created in-stream wetland: hydrology, phosphorus retention, and vegetation survival and growth, Wetlands 15(3):212-225. Niswander, S.F., and J.A. Moore. 1995. Treatment of pulp mill effluent with a constructed wetland. In: Proceedings of James A Vomocil Water Quality Conference, Wetlands Best Management Practices and Riparian Zones, Corvallis Oregon, pp. 2-23. Niswander, S.F., J.A. Moore, M.J. Gamroth, and S.M. Skarda. 1995. Treating dairy flushwater in a constructed wetland. In: Proceedings of James A Vomocil Water Quality Conference, Wetlands Best Management Practices and Riparian Zones, Corvallis Oregon. pp. 24-39. Skarda, S.M., J.A. Moore, S.F. Niswander, and M.J. Gamroth. 1994. Preliminary results of wetland for treatment of dairy farm wastewater. In: P.J. DuBowy and R.P. Reaves (Editors). Constructed Wetlands for Animal Waste Management, Lafayette, Indiana. pp. 34-42.